There was a time when the Giant Panda slept rather quietly behind a giant screen. It always seem to prefer things that way, languishing in the desultory way of giant pandas. But we Westerners kept poking the giant panda with a stick, so to speak. First the Polos looking for the riches of Cathay, then the seekers of souls for Christ, sniggling heir way in with promises of better eternities, then the British with their gunboats and opium, ready to addict the vast new marketplace like some schoolyard pusher (“the first hit is free, kid”). All the time the giant panda seemed not to have a reciprocal interest in the worlds of these poking and prodding outlanders. It was always trying to close the screen and carry on as before. Then came the Americans, who can’t seem to leave well enough alone, particularly where there is a buck to be made. 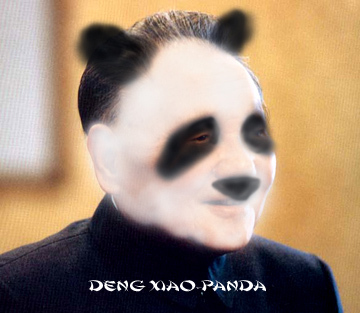 This time the Giant Panda had hibernated for a quarter century behind a screen constructed my Marx and Mao. Six years later a little panda was talking like Donald Trump. “To become rich is glorious,” he announced, unleashing hordes of fresh new capitalist-roaders on the globalizing economy. With dramatic suddenness that only the world’s most populous and chimerical nation can generate the world became like a room with am eight-hundred pound Giant Panda smack in the middle of it—sucking up the air, munching on the nachos and barbequed chicken wings, and slurping down most of the “cold ones.” And the rest of the world, the world that might have been more careful what it wished for, was picking up the tab. The Giant Panda used to be—and much of it still remains—a place of much poverty. It is 80 percent rural, made up of rice farmers living on a buck a day and up to their empty pockets in last night’s pee and poop; other farmers growing wheat, soybean and sorghum on land that pendulates between drought and inundation; and city people scraping out life in their respectivedanwei, in industries that specialized in inefficiency, outmoded technology and corruption. All of this was, and still is, superintended by the repressive, authoritarian, backward thinking political leadership of a bunch guys with prostates like cue balls. This was China—place with a billion and a third people. To poke it with a stick, let it loose with western economic values and a pent up taste and desire for consumer products, was something the West might have thought more carefully about. Now it is probably too late. Even at only a fraction of its population following the little Deng Xiaopanda’s exhortation the giant panda is a global force to be reckoned with. If the world’s gyros seem to be acquiring a bit of a wobble these days two forces might be considered. One is the huge migrations of China’s people from the countryside to the burgeoning industrial cities. How much that might throw China’s, then Asia’s, and then the World’s economic fortunes into a spin is yet to be determined. Already the world’s largest economy is nervous about the fact that China has already bought up a massive chuck of the debt America has floated to finance its adventure in the Middle East. China already makes something like eight-percent of the products sold by the world’s biggest retailer, Wal-Mart, the only stores that can be seen from space. Entire businesses have been nearly wiped out by the low labor costs that a nation of several hundred million farmers with train tickets can produce. Remember the old “Yellow Peril” of the 1950s? Well, China produces so much of the world’s clothing you can change that to “Yellow Apparel.” Check the label; it’s Made in China. Now to the other gyro. Elsewhere in the world glaciers are melting, and everybody but George Bush seems to have figured out that it has something to do with greenhouse gasses. With so much productive capacity and little in the way of emission controls, the Giant Panda has become a major contributor to the cookng up of the planet. Most of China’s major cities are already badly polluted. Beijing is already a three-pack-a-day city for any non-smokers waking around. In cities like Yinchuan in Northwestern China the blame goes to sulfur dioxide from coal, which is burned for everything from making electricity to cooking dinner. China produces twice as much of the stuff as America does, and even though projects like the Three Gorges Dam are intended to reduce the blue haze of coal-burning braziers, by some estimates, China may one day generate five times more than what is very visible today. But that’s only one half of its double environmental whammy. Production is followed by consumption, and China’s consumption has been waiting a long time. As cars replace those billion bicycles not only are America’s SUVs in for some major competition for fossil fuels, but also a lot more exhaust pipes are going to be emptying in to the carboniferous stew. Shanghai, it’s fascinating old city now crisscrossed with elevated freeways, its shopping streets re-fashioned into trendy pedestrian malls is already having traffic jams and giving land over to parking. The Three Gorges Dam may substitute electricity for the coal-induced haze, but the car exhaust will take its place. This progress is not only exacting a price upon the Chinese. Hong Kong’s and other South Asian cities are getting the spillover and NASA satellites show the dirty air as far away as Hawaii. China’s environment is a mounting problem for policy-makers in Beijing. The Giant Panda cranks out as much sulphur emission as Tokyo and LA combined but with far less vehicles. Of the world’s twenty most polluted cities China can claim sixteen. Water is polluted in nearly three-quarters of the country. Air pollution may account for the premature death of some 400,000 Chinese each year. Crop productivity is steadily decreasing in quantity and quality because of polluted land and water. Solid waste is expected to more than double over the next decade; China will then be well out in front of the US in that category. What will the Giant Panda do to rectify the problems of an economy that grows at seven percent per year and may double its GDP between now and 2010? There are internal protests, but they seem to have limited effect and more people would probably like to get in on the economic action. Other nations have become so tied into the Giant Panda’s productivity that, if production costs begin to escalate from internalized clean-up charges, the demon in the closet of capitalism, profits, becomes threatened. And the Giant Panda doesn’t want to sign on to environmental measures and accords that might spoil the ride, arguing that the US and Europe had their days of expansion and pollution, so now its his turn. Anyway, you know the old joke: Where does an 800-Pound Giant Panda sit? . . . Anyplace it damn well pleases.